500 pcs/ctn, carton sie: 62*38*51cm, G. W.: 13 kgs/ctn for small size. 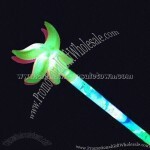 Glow palm or sole clapper is mainly used for concert, party, celebrations, and any entertainment occasions. The ingredients of the glow stick is non-toxic and non-flammable, but may permanently stain clothing or furniture. Usage: Bend and snap the glow stick along entire length, shake to start glow, and then connect it to the palm or sole bat. 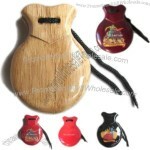 Children learning music will love this simple wooden castanets with musical instruments and percussion instruments. 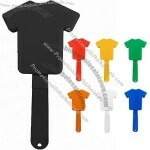 These T shirt shaped hand clappers can be used to cheer for your favorite team in the eve of your favorite team’s match. You don’t want to miss it. 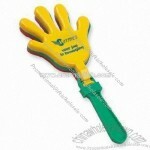 Body shaped hand clapper. You can take advantage of the surface area to print on the both sides for brand promotion. 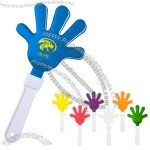 Personalized hand clappers which can be customized with your company logo and favorite color you wish. Size: 3 1/4" x 7 1/4" x 5/8"
The party is getting boring and sleepy? Take out your Hand clapper and start toying with your friends so that you can get the energy back in the room.Add L'Chaim to EVERY event. Packed in groups of 1 dozen. 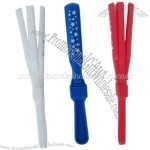 Size: 3 1/2" x 7 1/2" x 3/4"
Whatever the event may be seminars, parties, sports events or outing these hand shaped clappers can make some serious noise to kick start the fun. 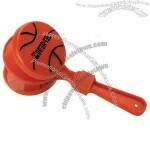 Product Size: 3 1/4" x 7 1/2" x 3/4"
Basketball shaped hand clapper is a great tool that you can bring to your favorite basketball game to make some noise and cheer your team. Imprint Area: Front/back 1 1/4" x 3/4"
Product Size: 2 3/4" x 7 1/4" x 1"
It’s time to bring some noise to the boring party. 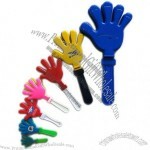 Use these hand shaped noisemaker and start getting the party alive. For birthday Patty, class parties, school activities, community activities, corporate events, concerts, parties, opening events, entertainment, etc. to mobilize the atmosphere. 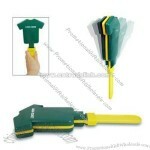 A great promotional tool that you can be used to promote your brand on occasion like parties, school events, games etc. 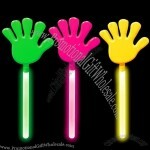 Light up every occasion using LED hand clappers. 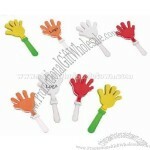 These Hand clappers make a cheering mood to every situation be it school events or parties. Our LED hand clapper features 3 colors (green, blue, red, pink). Turn it on/off by pressing the button on the handle. Each box contains an assortment of 12 LED hand clappers. Batteries are included and installed! Provide OEM service and the customer's design. With strong outer carton and inner. 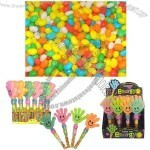 With different shape and colorful candy. Best promotional gifts for kids. Contract Manufacturing: OEM Service, Design Service, Buyer Label. 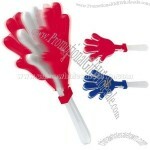 clapper,noisemaker,plastic toy is good for games and performance! Hand Clapper: This is a toy. Not used for children under 3 years. 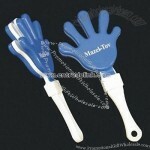 Product size: 11-1/4" x 5-3/8" x 15/16"
These hand clappers are meant to promote an event, a function or a sport. So, be it a school event, your favorite football team or your friend taking part in a match, these LED hand clappers are the best choice that you can land upon to cheer the team or the individual. 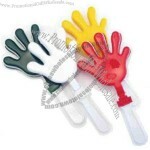 These hand clappers are available in four interesting colors—blue, green, pink and red. There is a button on the handle of the clappers by which you can turn on or turn off the light as per your wish. The clappers come with batteries which are already installed in it. 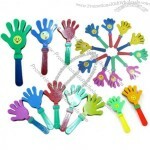 Custom-made Hand Clapper From China Factory, Low price Hand Clapper, Top Quality, True wholesale source for original!